I am not a fan of the traditional Easter party. I have never been one to grab a bunch of pastels, greens, blues and pinks as they don't really fit with my neutral loving style. So when I walked into World Market to get all the things I needed to decorate my Easter table I had one thing in mind, sticking to what I love. It was not hard at all! The first thing I spotted was these cream and white floral wreaths. They had this wispy look about them that just looked fresh and lively. I think wreaths are a great idea for a table, especially if you have a long table that has a lot of space that can be filled. They are a great way to add a larger detail without a tall floral arrangement blocking the faces of those across the table. Another thing I love about wreaths is that there is a perfect space to put a glass vase or matching candle. Although this table is set for an afternoon brunch, candle light on a table for a dinner always feels more intimate and festive. I have this really pretty farm table that I hate to cover, so I decided to go along with that and pull out the natural elements of the decor. If you aren't loving your table, just throw a white tablecloth over it! I did pick some white linen napkins, something about a fresh napkin always makes the table look better to me. I found some great dinnerware from World Market. The different patterns on the plates add some fun texture to the table. Mixing the simple designs really brings out subtle detail that makes the whole placesetting feel light, but not boring. I also got these modern looking bunny ear napkin holders that I tied the napkins onto. Instead of rollin’ up the linen napnkin and sliding it into the holder, I knotted it and let the ends fall like floppy bunny ears. I mean is that cute or what?? The next thing I added was the dainty glasses with a gold rim. The gold detail tied in with the gold flatware. Helpful hint: if you do buy gold flatware, try to hand wash them as much as possible. If you have to machine wash them, don't use detergent that has citrus in it. It will ruin them...I learned that the hard way. 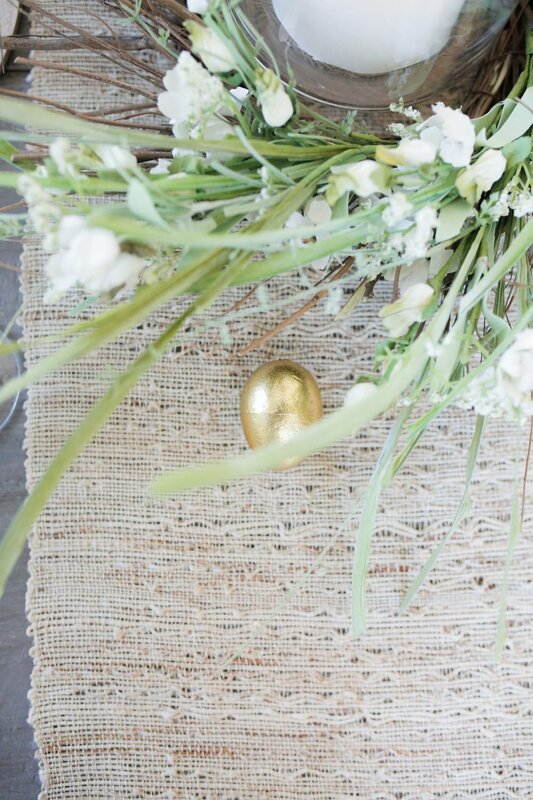 Gold eggs and candle holders were an easy choice for that extra touch of elegance. I love the combination of gold, cream and white. I just used colors and textures that I already love, and when you get what you love, you will be able to use the decorations in different ways time and time again. I think this table looks really fresh and timeless. Just by taking away the bunny details, this table could easily be used for a shower of some sort or even a spring luncheon with your girlfriends.